A smaller and more ornate version of our popular LF-PUM series, the Piccolina Pumpkins are completely handmade in Murano, Italy. 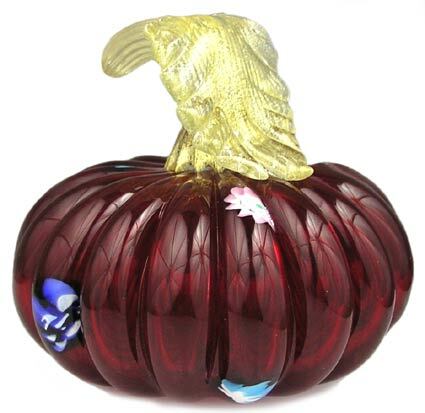 Each pumpkin features slices of murrine worked into the glass during blowing, as well as a crystal clear stem and leaf worked with 24kt gold-foil. Approximately 6 inches in diameter and 5 inches tall. 2.5 pounds.